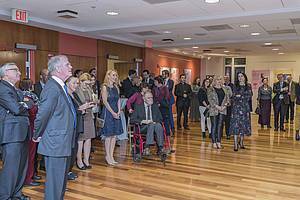 Washington, February 7: On occasion of marking the Slovenian cultural day, the Embassy of the Republic of Slovenia in Washington organized a reception on Wednesday, February 6 with a presentation of the original Prešeren manuscripts and the exhibition Prešeren in popular music. 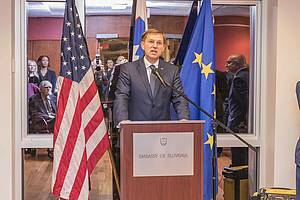 After welcoming remarks by the Ambassador Stanislav Vidovič, the Minister of Foreign Affairs Dr. Miro Cerar highlighted the importance of culture in establishing Slovene national identity and statehood. 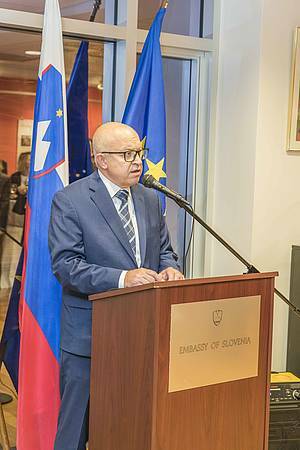 He recalled that the Slovenian anthem Zdravljica tells an important message of friendship among all nations and calls for freedom and peace with all the peoples. He said that therefore it is not surprising that Slovenians have the statue of a poet rather than of a warrior on a plinth of the main square of the capital. 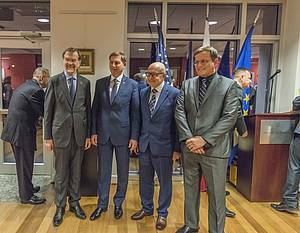 Foreign Minister Cerar also stressed that Slovenian foreign policy pursues these core values - fostering friendship among all nations, and pursuing peace and cooperation. 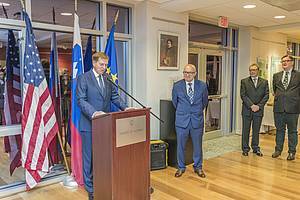 The main topic was the presentation of two recently found original Prešeren manuscripts with poems Slovo od mladosti – Farewell to Youth and Dohtar – the Doctor as well as the opening of the exhibition "Prešeren in popular music", prepared by the Upper-Carniolian regional museum in Kranj. 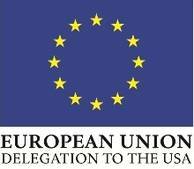 Prof. Dr. Luka Zibelnik from the Center for Slovene as a Second and Foreign Language of the Ljubljana University with a lectureship at the Cleveland State University gave a very interesting presentation of the manuscripts. The guests were also impressed with the exhibition about the Prešeren poetry turned into popular music and were able to listen to performances of different genres and musicians from chansons to rock on their smart phones. 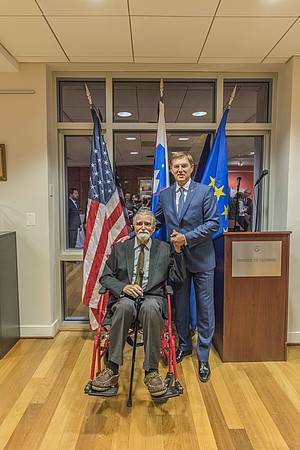 The event was dedicated to the local Slovenian community and American friends with whom the Embassy is participating with. 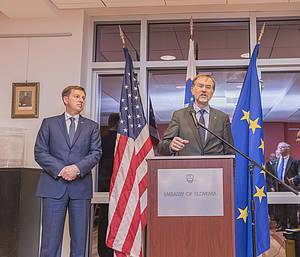 The reception was also attended by MEP and the first Prime Minister of Slovenia Lojze Peterle, who also addressed the participants.